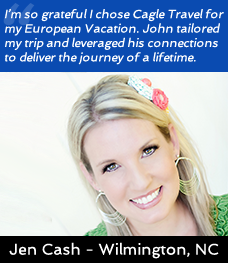 Welcome to Cagle Travel. Travel has the power to transform you. Celebrated experiences with loved ones are what life is all about, and chances are we have been where you want to go. The internet is overloaded with contradictory travel advice so let Cagle Travel un-complicate your journey. To all travelers who entrust their time and journeys with us, my goal is to provide consistently exceptional service and build loyal, long-term relationships. Finally, I strive to contribute to the High Point, Wilmington and other North Carolina communities in which I operate, and to enrich the lives of my clients. Travel is the optimal return on life, and I look forward to hitting the road with you. All Rights Reserved. Cagle Travel © | An affiliate of Coastline Travel Advisors, Inc.